The original version of this article, by Carl Haub, appeared on Demographics Revealed. There has been quite a bit made in the media and in blogs about low birth rates in industrialized countries. Quite correctly, many people (and countries!) are concerned that unprecedented aging and a dearth of younger people are leading to serious pressure on national budgets from a rising burden of support for the elderly because of a declining group of tax-paying workers. But the situation is far from equal everywhere, and less is written about that. The contrast between the age structures of the two country pairs above is striking, to say the least. All four countries have rather stable birth rates. If they stay that way, the demographic future of all four seems quite clear but in very different ways. These differences have profound implications for the future. Sharp shifts to an aging population will result in growing budgetary constraints, less ability to provide aid, and limited foreign policy options. France and Germany are neighboring countries with a long joint history. But their population pyramids are vastly different. France’s pyramid has developed into a fairly straight-sided example. If women in France continue to average about two children each, which they seem to be doing, the pyramid will evolve in a predictable way. Future numbers of women of childbearing age will be about the same as at present, keeping the population young and avoiding natural decrease (more deaths than births). In 2012, there were 1.4 births for every death, the same as in 1990. But, in Germany in 2012, there were only 0.8 births for every death. Deaths have outnumbered births in Germany since 1972. But there is another large difference between France and Germany. If Germany’s birth rate remains the same as it has been for many, many years, about 1.3 to 1.4 children per woman, deaths will continue to outnumber births by a larger and larger margin. Continue reading on Demographics Revealed. 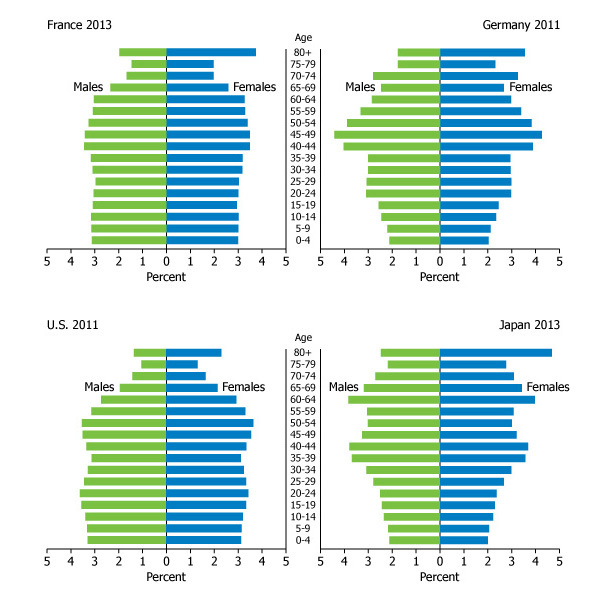 Image Credit: The population age structures of France, Germany, the United States, and Japan, courtesy of Carl Haub/Population Reference Bureau. Topics: aging, demography, foreign policy, France, Germany, global health, Japan, population, security, U.S. Ratios of workers to elderly have been falling for decades. Why worry now? Gains from productivity are likely to swamp any additional cost of care.